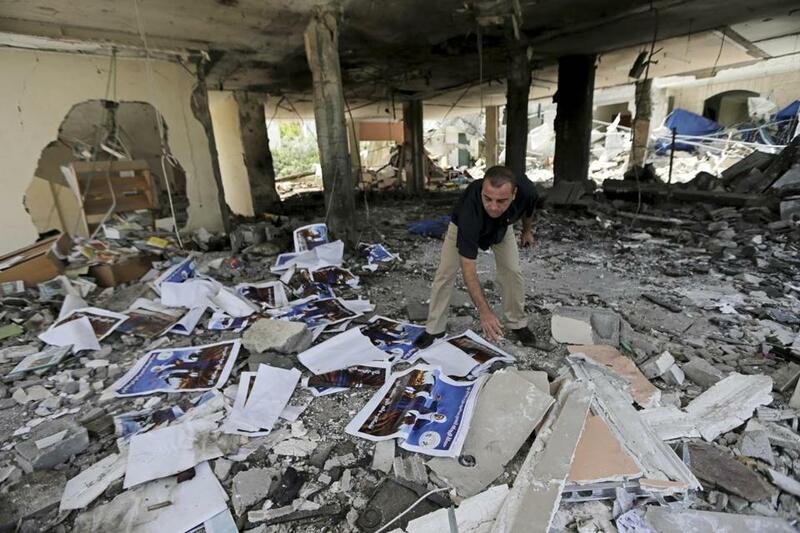 A man searched the rubble of a center for disabled in Gaza after an Israeli missile strike. BEIT LAHIYA, Gaza Strip — As Israel’s air war against Hamas and Islamic Jihad fighters in Gaza entered its sixth day Saturday, a pair of bombings threw the difficulties of the campaign into painful relief: Israel bombed a mosque, which its aerial photos indicated was harboring a weapons cache, and a center for the handicapped, killing two handicapped patients and wounding three, as well as a caretaker. The bombing of the center, the Mabaret Palestine Society here in northern Gaza, occurred just before dawn, when a missile crashed through the roof and exploded. Because it was the weekend, only five of the 19 severely handicapped residents were in residence, while the rest were with their families, said Jamila Elaiwa, who founded the center 20 years ago. She spoke at Al Shifa hospital’s burn unit while she was visiting the wounded, including Mai Hamada, 30, and Salwa Abu al-Qomssan, 53, the caretaker, both of them with severe burns, while two more patients were in intensive care. The dead were named as Ula Wisha, 31, and Suha Abusada, 39, whose family said had been born severely handicapped and unable to speak. Muhammad Abu al-Qomssan, 32, the caretaker’s eldest son, said that his mother “has a soft heart,” and felt fortunate to have found this new job only three weeks ago. She had been to pre-dawn prayers and told him she had arrived only a few minutes before the bomb struck, he said. Neighbors like Yasir Abu Shoodq, 32, stared up at the sky through the holes the missile cut through the roof and each floor before making a crater in the ground. Young children picked up the chunks of sharp steel from the crater and made off with them. Abu Shoodq said, and Elaiwa confirmed, that there had first been a warning rocket, “a knock on the roof,” a few minutes before the missile hit. “But no one understood what it meant,” she said. “No one could imagine the center would be a target for anyone.” In any case, she said, the residents were too handicapped to have fled the building on their own. As he spoke, perhaps a mile away, a rocket was launched from Gaza toward Israel, its contrail slightly wobbly in a hot, hazy sky. In a rare Saturday briefing for reporters at Israeli military headquarters in Tel Aviv, a senior Israeli military official said, when asked, that the army was looking into what happened at the center for the disabled. “A group is investigating now what was the target, what was the intelligence,” he said, speaking on the condition of anonymity in line with military protocol. The briefing was an apparent effort to rebuff growing international alarm at the rising death toll from the airstrikes in Gaza — 120 so far, according to Palestinian officials — and the calls for restraint. The official spoke of the difficulties the air force faced in minimizing collateral damage in the densely populated environment of Gaza, describing the mission as “very challenging,” and showed video clips from the air that he said demonstrated the military’s care in targeting. One clip showed a mission that was aborted because civilians, including children, were spotted in the vicinity of the target. Another showed a strike on a three-story house the official said belonged to a Hamas brigade commander in a crowded neighborhood of Khan Younis, which set off huge secondary explosions, indicating a weapons cache. At the mosque that was bombed Saturday, in the Nusseirat refugee camp in central Gaza, only the minaret was left standing. Young men joined the junior imam, Muhammad Hamad, 25, in digging through the rubble to save copies of the Quran and other religious works. But this attack, one of two mosques hit Saturday, was no mistake. Here Israeli intelligence was convinced, and issued photographs to support its case, that the mosque also served as “a Hamas rocket cache and a gathering point for militants,” the army’s spokesman, Lt. Col. Peter Lerner, said in a statement. Neighbors said that there had been a “knock on the roof,” followed by the bomb a few minutes later, and that only four people were wounded because it was too early for the predawn Ramadan prayers. Hamad said he had found a Quran open to a page with a particular sura that he felt had special meaning. “Victory is imminent for those who remain steadfast,” he read. Later on Saturday, six Palestinians were killed in a rocket strike outside an apartment building in Gaza City’s Sheikh Radwan neighborhood. The son of a local Hamas leader, Ismail Haniya, said the attack had targeted the home of his aunt, and two of the dead were her children. By late Saturday afternoon, Israel said, some 45 rockets had been launched from Gaza that day. Two were shot down and the rest fell into open spaces. The relatively low number indicated to some Israeli analysts of Arab affairs like Ehud Yaari, a journalist with Israel’s Channel 2, that Hamas was ready for a cease-fire, though he said that Israel was less enthusiastic for now.